LSAC, the Law School Admissions Council, is the gateway for the law school admission process. 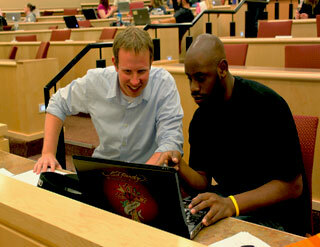 Most prospective students are first introduced to LSAC while preparing to take the Law School Admissions Test (LSAT). To apply to the University of Wyoming College of Law, you must have an account created on www.lsac.org. All admission applications to the University of Wyoming College of Law must be submitted through LSAC.org. This is the same system used to register for the LSAT. Deadlines: Our application for the following Fall semester opens on October 1st and priority is given to applications that are received and complete by our April 30th deadline. The College of Law will accept June LSAT scores on a case by case basis, and as space in the entering class permits. July LSAT scores are only accepted for the following year admission cycle in which they are taken. If you are unable to meet the April 30th deadline, please contact us at lawadmis@uwyo.edu or call (307) 766-6416 and ask to speak with someone in the Admissions Department. Early Admission Decisions: Applications received prior to December 15th of the year prior to intended year of enrollment will be considered for early admission. Early applications will receive an admissions decision by January 30th. Baccalaureate Degree - Candidates must have received a baccalaureate degree from a regionally accredited college or university prior to matriculation. Character and Fitness- Applicants must be of good moral character and must maintain good moral character as a condition of continuing enrollment. Details about the Character & Fitness questions on the application and more information about potential character and fitness issues in relation to sitting for a state bar exam can be found here. Official Transcripts from ALL the higher education institutions you have attended to LSAC. Personal Statement: Applicants must attach to their electronic application one personal statement. The personal statement should provide information about yourself that you consider significant to our evaluation of your file. We are interested in learning about the qualities that you would bring to the legal profession, the law school classroom, and the community. You may wish to describe a significant experience in your life or to discuss your interest in or motivation for attending law school. A typical personal statement is 2-3 pages. It will be evaluated for writing ability as well as content. Do not treat your personal statement as a narrative of your resume. ii. If you have been granted an LSAC fee waiver and would like an application fee waiver from the University of Wyoming College of Law, please enter the fee waiver code give to you by our Admissions Representative here. Please note: the online fee payment software is designed for compatibility with Internet Explorer. If you are using a different browser, you may receive an error indicating that the website cannot be found or that you are not authorized to view the page. All new applicants for the incoming first-year class will be considered for available Merit or Diversity Scholarships. While most scholarship awards are granted at the time of acceptance, some are granted after acceptance. Transfer, Visiting, and International Students are not eligible for scholarships. Seat Deposits: Accepted applicants who wish to reserve a seat in the entering class must make a non-refundable seat deposit of $500. The seat deposit can be paid in two installments of $250 or paid in full with one payment of $500. The deadlines for these seat deposits are stated in the acceptance letter. The total seat deposit of $500 will be credited toward total University tuition and fees at the time of registration. Accepted applicants who do not pay the deposit by the deadline, have declined the offer of admission and any scholarship awarded. Please note: seat deposits are also non-refundable. If you pay your seat deposit and choose not to enroll at UW, you forfeit that money. To pay your seat deposits, please visit this webpage. Application Status Checker: You can access your application status through Online Status Checker. Use the username and password that was sent to you via email by the UW College of Law Admissions Office. Contact us (307-766-6416 or lawadmis@uwyo.edu) if you misplace this email.